As we get older our tastes change. Maybe we get tired of the same old routine time after time after time. Maybe it's because we get exposed to new things and new ways of looking at old things. Something we never even tried as kids becomes our go to after giving it a look-see as an adult. Factors such as brain and body chemistry even come into play, making flavors we once loved into ones that no longer agree with us. Wait. Sorry, scrap everything I just said. That's for normal Humans. We're gamers. I know people today who are still playing the same Traveller campaign they started in 1977. I tried Dungeons & Dragons in 1977 and absolutely loved it. Then, sometime later, I played other games. With every other game I played I loved Role Playing Games in general even more and D&D less and less. I love trying new games and probably always will, but there are definitely RPGs that I repeatedly return to time and again. Some more often than others, either because it's harder to find an audience for them or I don't feel the inspiration as often as I do for my favorite-favorites. These are in no particular order though I suppose they are roughly listed from my least-most favorite to most-most favorite. My number one choice below is indeed my number one game. Also, these are the ones I enjoy and have the most fun with. They are not necessarily the best RPGs every written. My number two choice is certainly a contender for that spot and a game I think is mechanically superior to my number one choice. Essentially an improved version of West End Games' old Ghostbusters RPG, InSpectres adds a few new twists and tricks while remaining simple and versatile. I'd love to get back to using this system again for another GB outing. One of the few Medieval Fantasy Role-Playing Games I've encountered that actually feel both medieval and fantastic, Ars Magica is such a special work of art that it keeps bringing me back to it. Add in the games excellent treatment of folklore from all across Europe and this is definitely my go-to for wizards, knights, and dragons (when I go there of course). A game ahead of its time if only in regards to its subject matter, Japanese Giant Robots and Giant Robot Anime and Manga. As a fan of Mecha Anime before most people in the USA had even heard of the term, I absolutely adored Mekton and still do. I felt like, "Hey, this company likes what I like! They made a game for me!" I've been in a Mecha mood again recently. We'll have to see what happens with that. You can't mention Mekton or R. Talsorian without mentioning TFOS. As with Mekton and Mecha Anime, Teenagers from Outer Space came along at the perfect time for a teenage age Adam pretty much obsessed with 'Japanimation'. Like I noted above, I was into the subject well before Anime was a household word here in the United States and TFOS was exactly what I wanted at the time. Damn but I've run a lot of this RPG. I love it because it's simple, straightforward, versatile, and easy to modify. I think I've run almost as many non-Anime based campaigns with TFOS as I have Anime themed ones. There are times, phases I go through I suppose you could say, where I like this game even more than I usually do. I've come to realize that if I feel like I'm in the mood to run Superheroes, what really that means is that I am in the mood to run Champions. Once in a while I like to try other approaches for a different experience but I always go back to the grand-daddy of the genre. It's a little complex, a little clunky, and a lot of work but for some reason I just love it. Likely it's the versatility and the fact that it gives me the tools to build what I want instead of just pages and pages of powers that I would end up needing to modify on my own anyway. Yeah, my own game. Wanna make something of it? Well please do! Make your own off-the-wall puppet show series! I have to say, I am really proud of this game. It's not the slickest, or the most beautifully written, but it is fun and I like to think it really captures the feel of the subject matter. It's easy to learn and easy to play IF you get what it's about. It's niche, very niche, and I totally OK with that. It's funny to think back to the first time I ever played Traveller and realize how little I appreciated what the game was trying to accomplish. Maybe I should more accurately say, 'what the game could accomplish'. Traveller is one of those great games that is simple at first and more complex as you did deeper into it. Easy to learn, hard to master, eh? I started out disliking it and now it's one of my faves. I guess tastes do change. When I first read through the Playtest Rules of the Star Trek Adventures I didn't really get it. Having run Star Trek RPG campaigns for over 30 years prior to the game's release, I had a very clear idea in my head about how Star Trek games should work. Star Trek Adventures didn't function as I envisioned and as such it kind of turned me off. Fast forward to a few month later when I got to play it and I suddenly understood how it functioned. Now, nearly two years later (give or take) I am thoroughly enjoying it. It may honestly be the reason my current Star Trek campaign (converted from the Last Unicorn ICON System and now in its 4th year!) have worked so well and lasted so long. While a tad crunchy in some areas, its basic mechanics are easy to grasp and the addition of Momentum (a type of Hero or Drama Point) make for some really great dramatic moments. This is just about my favorite rules system ever made and very likely my second favorite game to run. I love Star Wars and the legendary Star Wars D6 System from the West End Games just works for it so well. I have said a lot about this system in the past and it is fairly well known so I won't go into too many details here. Instead I will sum it up like this, 'Imagine there is a meter measuring the level between Narrative Role Playing and Mechanical Crunch. Star Wars D6 is ever so slightly past the midway point at the center. It is on the Crunch side of the middle mark but only just'. IMHO, that's perfect for Star Wars. 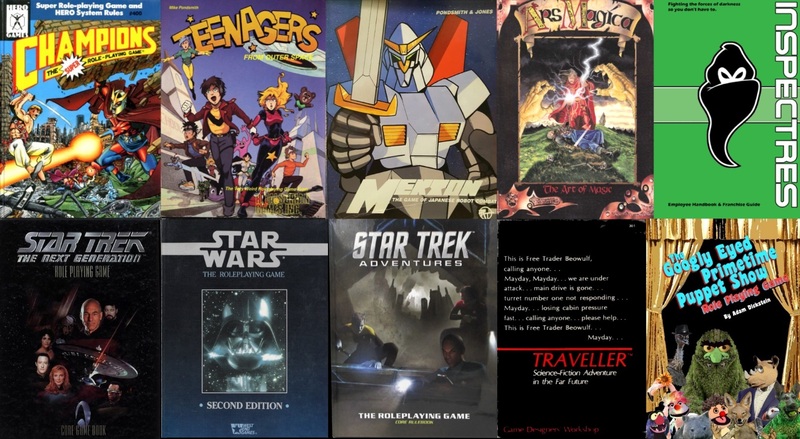 I would describe the three major Star Trek RPGs, produced by FASA, Last Unicorn Games, and Modiphius respectively, as follows: In the FASA game you create a character who lives in the Star Trek universe. In Modiphius' Star Trek Adventures you create a character who exists on a science fiction television show. In LUG's version, you create a character who lives in the Star Trek universe and then the game gives you the tiniest wink. It's very subtle and you might not even notice it. It beckons you closer and when you get near it gives you a playful jab and whispers, "Lighten up, this is based on a show". With pun fully intended, LUG Star Trek is the best of both worlds, a serious approach to Star Trek that never tries to assert it's own viewpoint but instead does everything in it's power to assert the viewpoint of the various TV series. This is made thoroughly apparent in the changes in tone and atmosphere between each of the core rulebooks. The Next Generation one is quite different from The Original Series one, which is in turn different from Deep Space Nine's. The mechanics are the same but the 'what is this game about' elements are adjusted from series to series. This post took longer to write than I intended. Hopefully now that it's done I can get the ball rolling with my plans for this month. Thanks for the short review of Ars Magica. I’d heard the name but didn’t know what it was. Sounds like something I would like to own. Wow, that is a VERY interesting list. I am very familiar with most of these games (the exceptions being the two Star Treks and Googly Eyed Puppets). Is there a particular edition of Ars Magica you prefer?